My son wants to be “left behind”. I feel that another year in the smaller, familiar middle school would be less intimidating and give him some time to mature. Because of the b’day he really wouldn’t be older than the rest anyway. I don’t want my child to be retained. Everything I read seems to say that retention is not good for the child. I’m struggling with the school because they say she is the youngest in her class and needs to stay behind so she can “catch-up”. She has struggled with reading and math for 2 years. I think she needs more help – not just being held back. 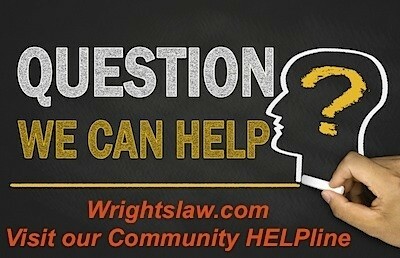 At Wrightslaw, we say: Read the research, educate yourself, get an expert involved. On that page, download and read these Position paper articles from (1) the National Association of School Psychologists, and (2) the American Federation of Teachers. Retention poses several problems – including the fact retained children are far more likely to drop out. If you are considering retaining a child, get an independent expert involved. This person can evaluate your child and help you use facts to make this important decision. If you want to read more, we’ll share a comment below from a parent who wanted retention for her son. She did her research, contacted the experts, and determined what she thought was the best route for her child. We don’t agree that retention is the best case for most children. But this parent’s advocacy strategy and tactics were well crafted. 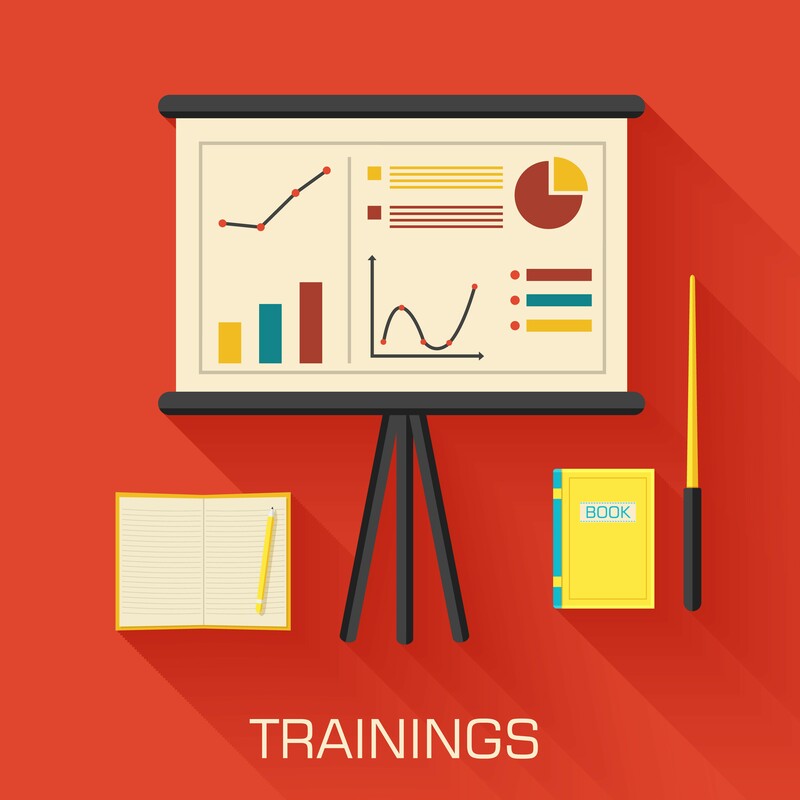 A lot of the research regarding retention says that it doesn’t work. But a lot of that research is based on keeping kids in the same instructional environment and kids who have extenuating circumstances outside of school. The extenuating circumstances did not apply to our son and we were asking for different supports and instructional techniques. Repeating a grade with no changes in supports or how the instruction is delivered generally has the same affect-not working. Finally, the new research shows that kids are not successful when they are being taught at a frustration level . . . they need to be taught at an appropriate instructional level. For our son, who is 1.4 years behind, moving ahead put him in the frustration level. All of these factors led us to ask for retention so he could catch up and move ahead the next year. We requested retention for many of the same reasons as you and were told it had never been done in our district beyond kindergarten or first and they were not going to do it. (We are about to go into middle school). The reasons were it hasn’t been done, it’s against policy, research doesn’t support it, etc. I talked to the principal and district people informally to find out all the reasons they would want to deny, then crafted a really nice power point (based on the types of info I learned at Wrightslaw Bootcamp about decining test scores (order the CD to find out how to draft your child’s dropping achievement scores). Then I got letters from his private providers (tutor, psychologist, etc.) and his doctors. The doctors said it would be too stressful for him to move ahead with such lagging academics and it would harm his health. The meeting began with the principal telling the 15-person team this had never been done and trying to coerce them to decide against before I even started. He announced that the three main people in the State Education office said it couldn’t be done. I had the policy that I got at the district which said nothing of the sort. 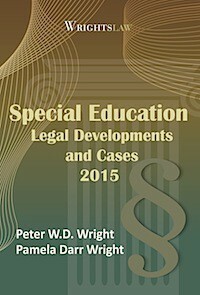 I passed it out, showed my slides a la Wrightslaw style, and we won or case. Don’t be discouraged if they tell you no. Do your homework, make a nice presentation that is prepared like the “letter to the stranger” (see Emotions to Advocacy book), and go for it. I never thought I could win on this request, but it turned out to be pretty easy. Good luck. 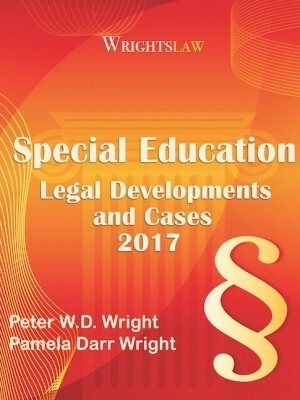 This entry was posted in Advocacy, FAQs, IDEA 2004, Independent Evaluations, Special Ed Law and tagged Advocacy, FAQs, IEE, Letter to the Stranger, promotion, retention by Wrightslaw. Bookmark the permalink. You need to contact the school immediately to set up a meeting and let them know face to face you do not want the retention. Unless your child is severely behind academically there is no reason that she cannot move on to the next grade. You also need to ask why is the school wanting to hold your child back? Id like to join the discussion, my son is 6 not turning 7 until 2 months into 2nd grade. He is young, but is physically and, I think emotionally ready to move on. The STAAR test I am familiar with is used in TX. If you live in TX, the organization I work for can assist you. http://www.prntexas.org You can find staff in your area to assist you. You may not be able to stop them from holding him back, but there are actions they are required to take to help him catch up. what resources were used for this parent’s position? we want our student retained for similar reasons. please share your resources. thankyou!!! Both my children were retained and my daughter is a national scholar student and my son makes straight A’s in middle school. Best decision we ever made. In what grade were ur kids retained? We are in a dilema as well, my son is in 5th grade and is struggling in the sense that he’s the youngest and feels out of place. His does good in school. He looks and feels frustrated everyday. And he turns 11 till aug28, so he would be still 10 when going to 6th grade. Any suggestions?? My son will be 5 in August. He’s in PAC and I want to retain him one more year because his VB MAPP places him at 30 months in development. He has health issues and still requires naps. I had 1st transition meeting where I was denied Retention. I’m going again Wednesday and don’t have high hopes. Any input will be awesome to prepare me for this. Am I doing the right thing retaining him? What grade were they retained and did they remain at the same school? My daughter is 8 yrs old and is currently in the 3rd grade. She has just recently qualified for an IEP(Special Education) help. We switched schools this year to a bigger and educationally solid school compared to where she had been going to school. With this switch she has made a tremendous turn around in all her classes, plus she made the principals honor roll for the first time this semester. With that being said, we have also came across a set back. She is testing at a 1st grade level on reading comprehension. She even had the state testing person baffled by how she tested. She is on the verge of being gifted in math, and reading fluency, but in comprehending what she has read or to concentrate she scores at a 1st grade level. Her school is wanting to retain her for this? My son is going through the same thing, what steps or measures have you taken? Hello, My 6y/o son is in 1st grade in an K-2 SDC class; however, he identifies himself as a kindergartner. His daily recess is with the kindergartners. He also mainstreams with a kindergarten class for about 30 minutes daily. His SDC class is composed of 6 kindergartners and 1 only other first grader. 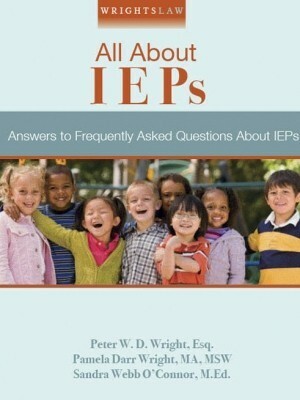 In previous years, the IEP team had discussed retention but it was not recommended at the time. For this upcoming IEP, I am requesting that he continues with first grade again next year, with additional opportunities to mainstream with the peers that he has developed relationships with this year. I found the feedback that highlighted gaining addition expert opinions to be helpful. I plan to seek advice from my son’s physician and psychologist asap. Any feedback would be appreciated. My son is a rising 9th grader. 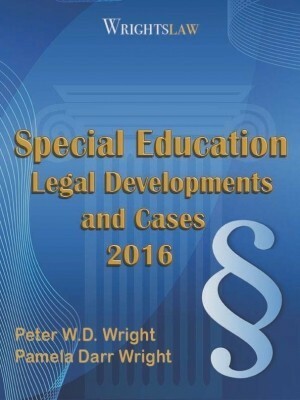 He has a specified academic plan (504) for ADD and a learning disability. As of his most current testing, his reading level was 4 grade 6 month. He is a tremendously slow reader who struggles with basic phonemic awareness. While he continues to “survive” in class, with a lot of support from his resource teacher at school and myself at home, we are concerned that with is reading level lagging so far behind, he will get to high school and find it much tougher to to keep his head above water despite continued support at school and home. We are looking to retain him and hopefully give him another year to close the gap in his reading deficiencies. His current school (private) is against him being retained due to the fact that he is passing his classes. Is his reading remediation program working for him? Another point is where is the assistive technology? There is some great assistive technology out there to help him keep up with course content. I don’t think retaining a 9th grader is wise. In many ways, it is humiliating at that age. The school has made it clear that they do not want him retained. Retention will not address this issue. He will still lag behind. The issue is to look at the progress, goals, needs, etc. High school is also a big leap for many students and can be difficult. The local high school may have a better remediation program than what he is currently receiving. Instead of retention, look at the many summer programs that may also benefit him and help him transition to high school. I debated enrolling my daughter into Kindergarten b/c she’s turned 5 on the cut off date (Sep1). Her preschool teacher said she could benefit from another year of preschool, but would also do fine going into K. I really was torn, but decided to give it a try and we’d just watch her closely throughout the year. She did very well in the beginning but now in the 2nd trimester, her lack of focus or frustration when she can’t complete a task are starting to show through. She’s also having a little trouble socializing – where she withdraws some days from her friends or gets a bit possessive with her close friends when others want to play. I’m not sure if I should retain her one more year as some of those things might be helped with added maturity. My daughter is a young first grader. 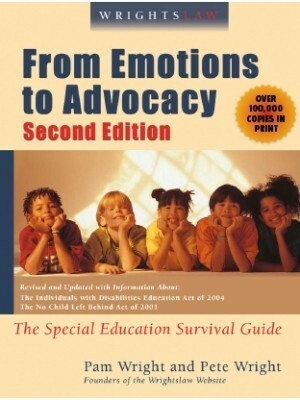 In K she was placed on an IEP for socialization and communication skills as well as speech and OT. We considered holding back then, but we’re convinced to move her forward. This year they diagnosed her with autism, sever socialization deficits. 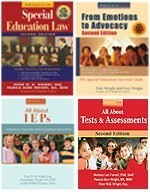 We’ve adjusted her IEP to include help in reading comprehension and math computation, areas where she is really struggling. Her main problem with autism is socialization, so we are concerned about holding her back and putting her with a whole new group of kids, but don’t want her to struggle academically and fall further behind. She says she wouldn’t mind to stay in first grade after explaining her friends will be in 2nd and she can make new friends. Autism is a neurological problem, not a matter of maturity vs. immaturity. If you hold her back, she will continue to have the same issues even if she repeats first grade.. That she’s even with normal kids and not in a special education setting is a huge plus. You should have her evaluated by an outside expert (check with the local university) to see if he concurs with this diagnosis. Schools can be mistaken. It sounds like everything is being done that should be done and you are right on track with your decision. You know your daughter best. After much deliberation, we are getting her re-evaluated by an outside developmental team at the university. She doesn’t meet all the criteria of autism from our perspective. Hopefully they will be able to give some guidance on the holding back issue. We also have a meeting set up with our daughter’s teacher a couple days after her appointment. I’m looking forward to getting this all sorted out! For socialization, that’s just something she has to work on herself, no one can make it easier. Finally, make sure your daughter takes advantage of any tutoring that is available, either on campus or off. Call the principal and see if her school offers any; if it doesn’t call the local high school. As I parent, I feel related to your issues. How is her attention level? Does she has difficulty with focusing? Issues with short attention could be a problem in following conversation and making friends. Your description sounds like there are some problems related to “executive function” (which are related to things such as chronic lateness, missing deadline, forgetting to turn in assignments, poor organization and time management). You may find helpful doing some research on this topic. I am really not in favor of retention as I don’t think that this is a solution to the problem. If your daughter is served through special ed, you can request that she be evaluated for executive functioning issues, & provided social skills training. The national school psychologists’ association has taken the position that retention in general is not beneficial to students. I have nine year old boy girl twins. My daughter is in the summer reading remedial program to get promoted to the fourth grade. My son stated that if his twin is not promoted he is not going to fourth grade. He wants to stay together. I am a firm believer of promotion with intensive intervention as opposed to retention. Unfortunately I had a son that was retained in the third grade and he only regressed. Also, unfortunately, my husband had a twin sister and she was retained in elementary school. It severed the bond between them when they were separated by grade level. His twin was referred to as the “stupid one”. It was and still is devastating. I feel that my daughter will catch up as she is not far behind and I have the backing of the school adm but district won’t waive. My child was placed in a Language Based Class for her mixed expressive recessive language disability / dyslexia. It turns out she was repeating prior years and lower then last years curriculum. She is already 3 years behind in reading. I agreed to place her in The Language Development Class because she should have her classwork delivered the way kids with dyslexia need it. My daughter complained she was not studying what her peers studied for social studies. The special education teacher has refused to provide curriculum information and the principal told me it would have been unfair to the other students in same class if my daughter received 1:1 instruction at her grade level social studies class work. The principal later said he spoke out of content. Please advise. My grandson started 3 grade in Florida six months ago after moving from Georgia. they want to retain him because of reading, mind you all the other subjects are A and B. I’m not agreeing with this, only because he hasn’t had sufficient time to progress. the teacher did offer help, that was only for a month of after school classes twice a week. Talking to him about the possibility of being in the 3rd grade again is horrific, he’s really devastated and doesn’t want to go to school. what do I do? My son was held back due to the lack of work from teachers, due to he has a disability. what do i do? My son is autistic and is on six grade, he is very small he is the size of a seven year old boy hardly verbal he is not ready for middle school physically or emotionally. We requested the school to retain him for one year, since he has never been retain to give a chance to mature little, but the school refuses. What are my rights and what can I do? Please help. my son is 18 years old, he is still at grade 10, he repeat this class for the second time. he still likes to go to school, so am worried about the age. 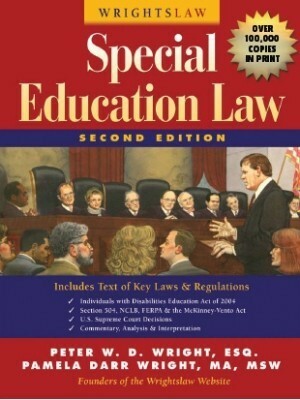 Law states that students with special needs can stay in high school up until the age of 22. Every child is different. If he does not feel insecure about himself than he should be ok. He can also take an online class if he failed a particular subject. Do not retained your child, Help your child and get them a tutorial. work with them at home. Make sure their in an after school tutorial for extra help. Dont ever retained your kids. I am an High school Junior thats suppose to be a graduating senior this year. I have gotten retained in the third grade. Don’t retain your child. Don’t hurt them. Eventually they will or try to hurt them selves. Its been plenty of times where I wanted to drop out or commit suicide. Too many times. Retaining doesn’t affect everyone the same way so dont retained your child thinking it will help. But it will only tire them. ooh thank you so much for that,exactly my thoughts. I’m in Mississippi the public county school is somewhat independent and you have to fail by a certain grade to take summer school or your child would just be retained!! an there is nothing you can do as a parent I’ve been fighting this for 2 months does anyone have any suggestions?